The Water Torture.— Facsimile of a Woodcut in J. Damhoudère's Praxis Rerum Criminalium: in 4to, Antwerp, 1556. The death of 23 year old, Essam Atta, at Tora prison in Cairo has prompted public anger and mass demonstrations. Rights activists and family members claimed Atta was tortured to death by repeatedly forcing large quantities of water into his body using hoses over the course of two days. A report issued by the university hospital attributed the young man’s death to vomiting blood (hematemesis) and subsequent circulatory failure. Two related torture theories have emerged – one states that Atta died as a result of the forced ingestion of large amounts of water and the other states that he died as a result of ingesting a detergent mix which lead to the formation of a corrosive ulcer of the stomach. I discuss the detergent theory in another article (Essam Atta – swallowing detergent is standard prison procedure in Egypt). However, it is important to note that these theories are not mutually exclusive and that depending on the amount of forced water ingestion it may still result in water intoxication and death. As a doctor at first I was skeptical since I couldn’t imagine the mechanism by which forcing water through the gut could lead to death. Upon further research, it turns out that it’s a documented method of torture, ironically termed: Water Cure. 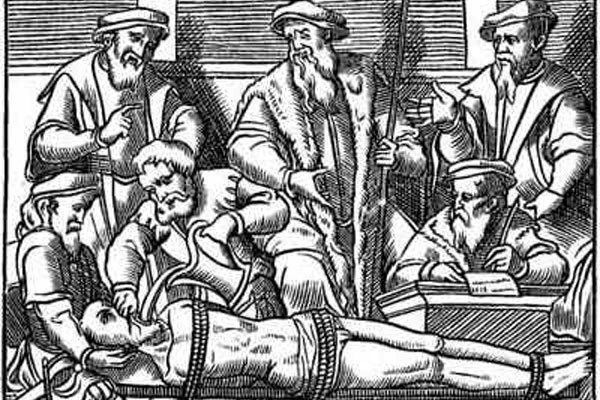 Water cure was used as a form of legal torture and execution by the courts of France since the Middle Ages. It was also utilized during the Spanish Inquisition and in the Thirty Years War between Protestants and Catholics (1618–1648). In modern times, however, it is the United States which takes the lead. Just as the term “waterboarding”, another method of water torture, was introduced in by the US at the turn of the 21st century, the use of “water cure” was authorized by the US government almost 100 years earlier. The procedure was utilized by the Police to compel confessions from suspected criminals as well as by the army during the Philippine-American War. The procedure involves the forced drinking of large quantities of water in a short time, resulting in gastric distension, water intoxication and possibly death. The stomach fills until near bursting and is sometimes beaten until the victim vomits and the torture begins again. This happens repeatedly until osmosis causes the cells to explode. In the brain, swelling of the cells increases intracranial pressure (ICP). It is this increase in pressure which leads to the first observable symptoms of water intoxication: headache, personality changes, confusion, irritability, and drowsiness. The cells in the brain may swell to the point where blood flow is interrupted resulting in cerebral edema. Swollen brain cells may also apply pressure to the brain stem causing central nervous system dysfunction. Both cerebral edema and interference with the central nervous system are dangerous and could result in seizures, brain damage, coma or death. In clinical cases, water intoxication can be easily diagnosed by biochemical analyses (low blood sodium) in addition to the history and behavior of the patient. However postmortem examination of an alleged case of water intoxication can be challenging. Subtitle: Discharged soldier tells senate committee how and why the torture was inflicted. Washington, May 3. – L.E. Hallock of Boston, Mass., formerly a Seargeant and later a private in Company I, Twenty-sixth Volunteer Infantry, testified today before the Senate Committee on the Philippines concerning the practice of water cure in the Philippine archipelago. He told of the infliction of the cure upon a dozen natives at the town of Leon, Province of Panay…. 2. Sturtz, Homer Clyde (1907). “The water cure from a missionary point of view”. from the ‘Central Christian Advocate,’ Kansas, June 4, 1902.